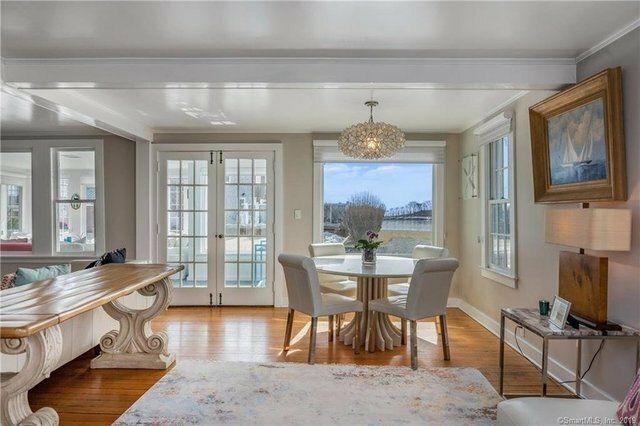 If you're dreaming of a more relaxed way of living, in a beach house by the shore, this colonial style home is located in the heart of one of Madison's best addresses, Middle Beach Rd! Just three doors from the Madison Beach Club, deeded access to L.I.S. and walking distance to town center. This light filled home has been lovingly renovated by the current owners. Striking a perfect balance between casual yet luxe, the home highlights L.I.S views and spectacular sunsets from many of the rooms. The home is thoughtfully re-imagined, keeping some of the old world charm, while adding a breezy and crisp modern aesthetic for today's buyer. Once the home of renowned painter, Bradshaw Crandell, his former art studio is now a spacious dining space with cathedral height ceilings, a wall of windows and statement lighting! Each of the 3 1/2 baths have been gutted using only the best materials including tile and vanities by Porcelanosa. The master suite has been reconfigured adding a huge walk-in closet and an expanded en-suite spa like bath with a large walk-in marble shower, teak vanity and radiant heat flooring. The kitchen features all new appliances and Plain & Fancy Custom Cabinetry. Additional renovations include new lighting throughout, electrical, and all cosmetics including custom shades on every window. The current owners brought in central air and natural gas from the street, significantly reducing heating costs. See additional remarks for renovated guest house.